More room for error: The process is a less delicate one than the French method. Here, you stir the almond meal and confectioners' sugar into half the egg whites and make a very thick paste. The rest of the egg whites get turned into an Italian meringue that is thick and glossy (very sturdy) and you work that into the almond mixture. It's not so much a delicate process of not over-mixing but working it pretty hard to loosen it up. So there's less of a chance of over doing it and it's easier to tell when you've reached that thick lava-like consistency you're after. A more sturdy, "professional" macaron: Ultimately, this is the most important pro. In my experience here, this Italian method made for dense, chewy macaron shells that did not have a hallow within it. I've had instances in the past where if I pressed too hard on the macaron, the shell could crack because of that hallow space beneath the crisp shell. Those French-method macarons were always delicious - and chewy (just the way I like them) but I didn't feel comfortable giving them out as gifts. These are gift-worthy. Extra-steps: The Italian method requires making an Italian meringue, which means the extra steps involved in heating sugar and water into a hot syrup around 245 degrees before pouring it into the egg whites. You'll need a candy thermometer and the process takes about 10 minutes or so. Obviously, it requires additional care and attention, a bit of a trade-off for the extra room for error in the macaronage (the stirring of the batter to get to that lava-like consistency). More time-consuming: Basically, the extra steps take extra time and involve a bit more clean-up. It's a little more complicated than the French method. This was my first attempt at the Italian method so I'll need more firsthand experience to answer definitively...but as of this moment, I have to say that I prefer this Italian method! I love that they don't have the hallow shell issue (hopefully, it's not a one-time thing) and they just seem sturdier. The process is more time-consuming but I like how the batter is less delicate to work with. The next batch of macarons I make will be using the Italian method. As with most new recipe or technique you're trying for the first time, you learn and realize things you might want to do differently next time. I found Dorie's detailed instructions helpful and easy to follow. The one thing that tripped me up (aside from my own inabilities such as not being able to pipe the shells the same size - they always start off about the intended size but then get larger and larger!) was the process of whipping the egg whites while the sugar syrup heats up. You whip the whites in the mixer to medium-firm peaks and then the recipe says to turn the speed down to low while the sugar comes up to temperature. Without any sugar in the whites at that point, I found my egg whites breaking. When I added the syrup and everything was incorporated, my meringue was thick and glossy but there were small lumps that I felt shouldn't be there. Next time, I'm going to time the whipping of the whites closer to when I expect the syrup to be ready. Luckily, there were no issues with the taste and final texture of the baked macaron shells. Also, the oven temperature for baking these, at 350, was higher than the typical 300 degrees I'm familiar with. I find you might want to keep a close eye on them. While I kept the temp. mostly at 350, I did adjust it in some moments when I thought the oven might be running too hot. Macarons are just entirely unique in some of these nuances. Or is it just me?! What do you think? If you've tried both the French and Italian methods of macarons, I'd love to know what you think and which you prefer. I'm very curious! Any suggestions, comments, tips would be much welcomed! Make macaron shells: Line 2 baking sheets with parchment paper or silicon baking mats (I prefer silicon mats). Fit a large pastry bag with a plain 1/2-inch tip (or cut an opening) and set aside. Set a strainer over a large bowl and press the almond flour and confectioners' sugar through the mesh. Whisk to combine. Place half the egg whites in a bowl of a stand mixer fitted with the whisk attachment. Pour the other half of the whites over the almond meal/confectioners' sugar. Using a rubber spatula, mix and mash the whites into the dry ingredients until you have a homogeneous paste. It will be thick, almost resembling almond paste. In a small saucepan, bring granulated sugar and water to a boil over medium heat. If there are spatters on the side of the pan, wash them down with a pastry brush dipped in cold water. Using a candy thermometer, cook syrup until it reaches 243 to 245 degrees, about 10 minutes. When sugar is ready, carefully take the pan off the heat, removing the thermometer. With the mixer on low speed, carefully pour the hot syrup in between the moving whisk and the side of the bowl. You'll have some sugar splatters but ignore them; do not try to incorporate them into the meringue. Raise the mixer speed to high and beat until meringue cools to room temperature, about 10 minutes. You'll be able to tell by touching the bottom of the bowl. Give the almond meal mixture a quick mix, then scrape meringue over it and fold together with a sturdy rubber spatula. Do not be gentle; you are using the spatula to cut through the meringue and the thick almond mixture. Cut your spatula down into the bottom of the bowl, bring it over the top and press it against the side of the bowl (fold, mix, and mash pattern). Continue doing this until the batter reaches the consistency of lava (lift your spatula up and it should flow down in a thick mass that settles into itself). Spoon half the batter into the pastry bag. Hold bag vertically about 1 inch above the baking sheet and pipe out 1 1/2-inch rounds, spaced at least an inch apart. Pick baking sheet up about 8 inches above the counter and let it fall - this helps eliminate bubbles and promote smooth tops. Refill bag with the rest of the batter and repeat with the second sheet. Let batter sit on baking sheets in a cool, dry place until the surface is slightly dry (you can test by very lightly touching one with your finger and there should not be any batter sticking), about 15-30 minutes depending on temperature and humidity. While this is happening, preheat oven to 350 degrees and have a rack set in the center position. Bake macarons, one sheet at a time, for 6 minutes. Then rotate the pan and bake for another 6-9 minutes, or until macarons can be lifted from mat or carefully peeled from the paper. Remove from the oven, slide parchment or silicon mat with the macarons off the sheet and place onto a cooling rack to cool to room temperature. Repeat with second baking sheet. Once cooled, carefully remove macaron shells from parchment or baking mat and pair them up in size for filling. Make chocolate-hazelnut ganache filling: Place chopped chocolate and espresso powder into a heatproof bowl. Heat the cream in a small saucepan. Remove the cream from the heat once it begins to boil. Pour the hot cream over the chopped chocolate and let sit for one minute. Beginning at the center, slowly whisk the chocolate and cream together until combined. Add the hazelnut paste and mix together. Let the mixture sit at room temperature, stirring occasionally, until the ganache is fully cooled and thick enough to spread. 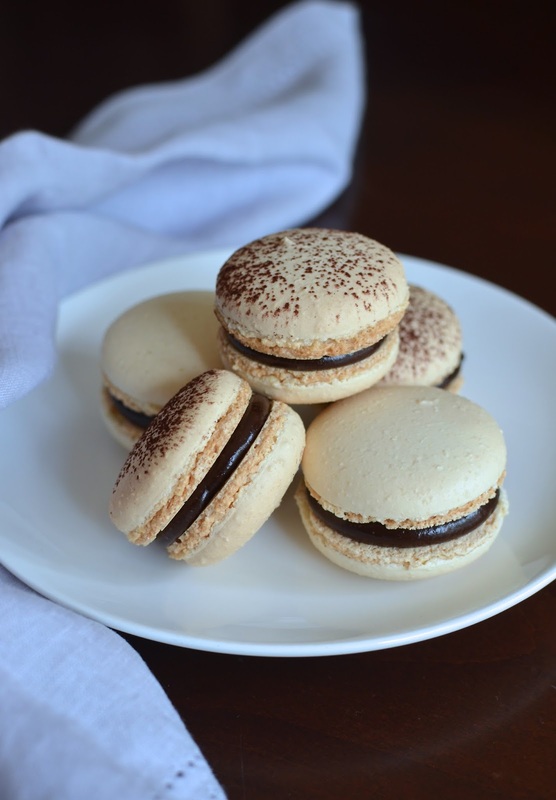 Finish macarons: To pipe (this is fastest method), transfer ganache into a pastry or zip-lock bag, with a tip cut off. 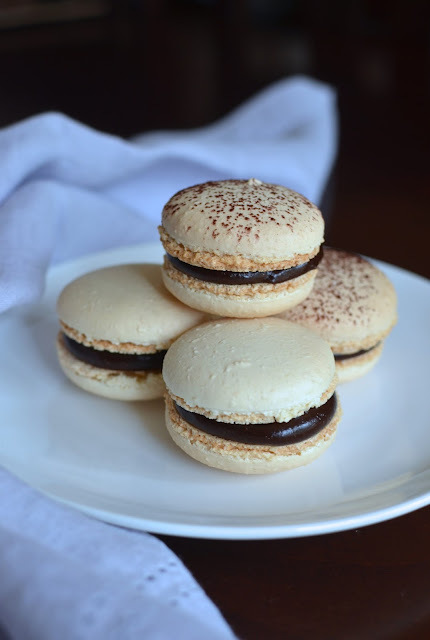 Otherwise, simply use a small offset spatula to spread ganache (amount depending on your preference) onto a flat side of a macaron shell before sandwiching with another and gently twisting the top macaron until filling spreads to the edges. 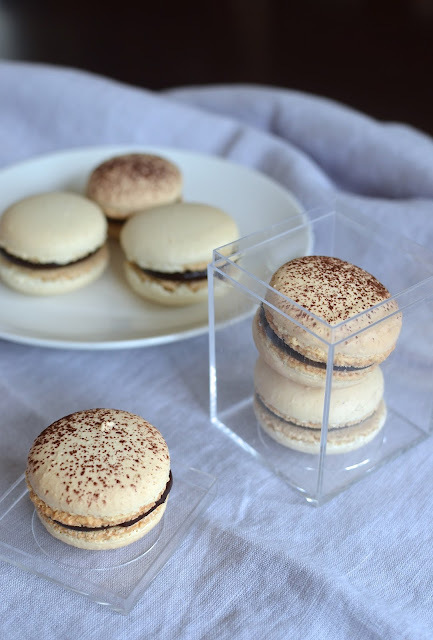 Once sandwiched, place macarons into an airtight container and refrigerate for at least 24 hours (this "rest" allows them to soften slightly and for flavors to meld), or up to 4 days. Bring macarons to room temperature before serving. I only tried the French method, and I was quite satisfied with the result. Must give this a try some time as yours turned out GREAT! Your macarons turned out beautifully Monica! Well done :D I've had as many successes and failures with these little beauties. These are truly beautiful Monica! You did a wonderful job - these look like they belong in a pastry shop. Love that chocolate-hazelnut ganache - so yummy! The cocoa top is so pretty too. I think you know I love the Italian method and really enjoy the hot syrup egg white extravaganza :) It just feels like a home run. I love that this method is more forgiving and the batter will not deflate as easily with one turn of the spatula. Bravo!!! Thank you, thank you, Tricia! You were definitely one of the inspirations behind trying this method and getting out of that 'comfort zone'! Your macarons are incredible and I'm sure you're thinking 'what's all the fuss about' since it must be so much easier for you! These look so beautiful and that filling sounds divine! Your macarons are absolutely gorgeous, Monica! I've always wanted to try the Italian method but had no idea if it made a difference and I'm so glad to see you sharing these :) Yours looks perfect and SO professional! Love that you dusted some with cocoa and the chocolate hazelnut ganache sounds incredible! This was a fascinating (and informative!) post! I have been meaning to try making macarons for the longest time ... and just never seem to make it happen. These look fantastic! They look pretty darn perfect to me! Aww...thank you, Ashley! I am most likely totally making a big whoop out of nothing. It's probably so simple for some people but for me, I've got like a hundred questions and thoughts! Maybe I over-think it. Anyway, thank you! Hi Monica, first of all I did not know there was an Italian method. I have that cookbook I should try it, your macarons look amazing. I am constantly discovering recipes in that cookbook, Cheri! It's just great. Thank you! These are absolutely stunning. Macarons have been on my epic list of things to experiment. I know what you mean about a list, Balvinder! I have a list and though it's gone down a lot since I started this blog, something always pops into mind. It'll never end and I suppose that's a good thing. Thanks for stopping by! I'm so impressed that you've actually tried two different methods of macarons! They look gorgeous - you've really mastered them. Oh my gosh Monica - these Macarons are beautiful! I've been afraid to attempt them, because I've heard they are hard to do. Yet, yours look like they came out of a French Bakery! Nicely done girl! They are just one of those things for which you can't just simply follow the recipe and you kind of have to get the feel for it. I never know how it'll turn out but they are good enough for us. : ) Thanks for the encouragement! These are stunning- bakery quality for sure! I have yet to try them, but I'm further intrigued by the Italian method. So delicious! I haven't tried the Italian method as of yet. I always default to the French method because that is my comfort zone. LOL. Guess I have to try new things now! Ooh! I didn't know there was an Italian method v. French method of making macarons, but I do like the look of these Italian macarons! Professional indeed; how exciting! When you decide to give it a go, if ever, you'll have to pick one. ; ) Not professional at all but thank you, Monica! I'm so glad you did this post! I've been meaning to try the Italian method with macarons for a while but scared since it took a long time to 'get' the french method down. So happy you were successful!! Another beautifully delicious experiment Monica! If I lived a little closer I would love to be your quality assurance analyzer for these kinds of things. It's just a " dreadful job" but someone must do it... wink wink... I think they use the French method here in HK. I have made them a couple of times with the French method and I can tell you my biggest issue is getting my meringues the same size, yours are perfect. How did you do that? It's not so much courage but probably just finding the motivation, right? Sometimes you just don't know if something is even worth the trouble...but when the urge/mood strikes, it strikes. Thank you, Christin! I have never tried the Italian method, always kind of overwhelmed me. I never would have guess that this method is more forgiving. For me this was a little bit of a complicated process. I am convinced now, will try this one for sure. To the macarons, not that you are hearing this for the first time, but they look perfect, beyond perfect. Perfect little feet, the mounds are perfect, the stuffing..everything about it lovely. I never buy macarons outside, I think home made ones are the best. You really did a great job on this. Your family for sure would've enjoyed. You are too kind, Asha. Thank you. I almost can't believe you don't buy macarons outside...but at the same time, I can totally picture it given your magic in the kitchen. I would love to see yours and I know the flavors have got to be so creative. GORGEOUS! Monica, these macarons look like the ones from fancy bakeries. Love the touch of cocoa powder. The chocolate hazelnut filling sounds totally irresistible as well. I have only tried the French method so far. The hot syrup into egg white does sound a bit intimidating, but it is nice to hear you had such a great result. I am now convinced to give it a try! Oh gosh, you are too kind! Thank you and I'm glad (and sorry) to encourage you to give this other method a try. Just when you think you're comfortable with something, it gets shaken up, right? If you ever try it, I'd love to know what you think. Jo!! Hi there! Thank you so much for your sweet comment. I totally remember your marshmallow wizardry! You would have no problems with the Italian method - in fact, you might like it more. It really is more forgiving, if more time consuming. Thanks for stopping by...hope you're having a good summer!